New CPS CEO Forrest Claypool has made it clear that the district has no Plan B if the state does not step in to close the $480 million budget hole in CPS 2016 budget. The district is proposing their FY 2016 budget without accounting for nearly 10% of needed revenue, and is expecting the state to grant it hundreds of millions in a pension holiday and additional appropriations. If the state fails to act, the district has no backup plan, other than wide-scale layoffs and chaos in January, half-way into the school year. But we shouldn’t let the fear-mongering about the absence of a backup plan trick us into believing the district has a Plan A, they don’t, nor have they had one in the past. What they are proposing for 2016 amounts to another pension holiday, kicking the can down the road for debt payments, and a reliance on promises of appropriations without any new concrete revenue streams attached to them. We’ve seen this before: from 2011 to 2014 the district received a three-year pension holiday worth over one billion dollars, and yet did nothing to secure new revenue sources. The district worsened the health of the pension fund while passing budgets balanced on the backs of closed schools, layoffs, and substantial expansions of charters at the expense of our neighborhood schools. 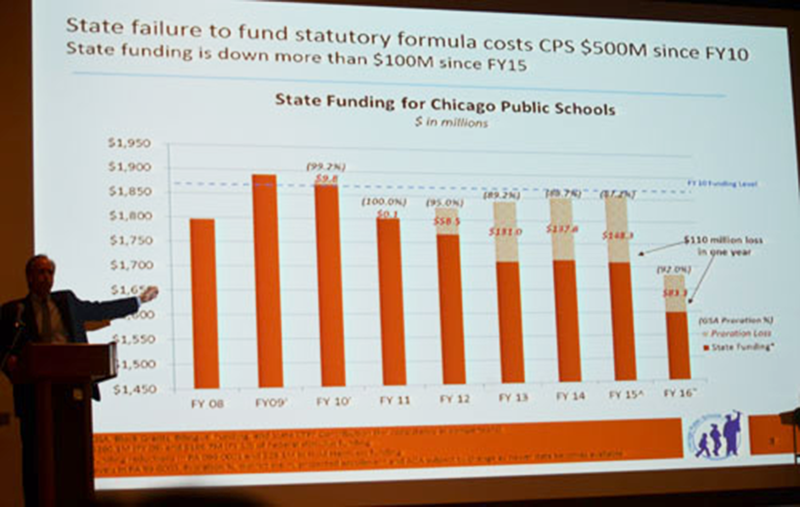 For years we’ve had a cratering budget at CPS, expected, known, and in many ways furthered by the administration. There have been calls from the teachers and community for sustainable revenue options. But there’s been another group of actors that have played a background role warning about the need – albeit a cynical role, since their actions have in many ways furthered the district’s financial straits. They are the credit rating agencies. Last year, before the Supreme Court had ruled on the pension-cutting measure, and even prior to their ruling on retiree health-care benefits, Moody’s released a report stating that even with those unconstitutional reforms in place, it will “not alleviate the need for substantial new revenue” for the city. The price of failing to raise new revenue has climbed higher and higher since then. CPS now has a junk bond rating by all 3 main credit raters. We’ve been paying punishing interest rates on our recent bond issuances, rates that, according to the Chicago Tribune “pay returns on par with what investors earn on lucrative but risky junk bonds sold by distressed oil and gas companies.” The bond market for oil and gas companies has been described this year as a “silo of misery”. We all know Chicago’s economy is far from a “silo of misery” for those that it works for, and we also all know Chicago governments, given the strength of this region and economy, have no sound reason to go bankrupt, nor to default on their obligations – so why is CPS paying such high penalty interest rates? These past weeks, CPS may be giving the markets good reason. CPS is facing a precipice – with a budget that cuts deeply into special needs services, and destabilizes our school programs. A $1 billion dollar short-term credit line is expected to be drawn down throughout the school year, and another $1 billion in bond issuance (to use for scoop & toss debt, and swap payments) has been authorized. For the $1 billion credit line, CPS is anticipating paying $24 million in interest fees for their cash needs – that’s not money for services to our students, not money to pay back debt on pensions, not money to finance school construction over the long-term. It’s just a penalty rate, precipitated and self-inflicted by not having confronted in advance their need for new sustainable revenue. That $24 million in fact, eats up the entire amount of increasing the property tax levy to the cap this year, and also represents two-thirds of the disastrous cuts to special education going on across the entire district. Yet even as CPS rolled out what they referred to as an ‘unconscionable’ budget, a budget with a $480 million hole, they are simultaneously supporting a bill-package in the Illinois legislature that would include a freeze on CPS’ and the City of Chicago’s ultimate source of revenue. They are supporting a bill to freeze property taxes across the state of Illinois for two years. We need to re-structure how we raise revenue from our healthy economy. But killing off the district’s and the city’s ultimate source of revenue is not just short-sighted, but could prove to further this year’s disastrous budget. This is ‘reform’ without ‘revenue’, and it’s not clear how CPS’ access to continued borrowing will be impacted when our ultimate source of paying back our debts is frozen in place. How high will our interest rates climb? Last year debt service on interest alone cost the school district $300 million. All of CPS bonds are ultimately backed by property taxes. We pay $50 million in annual debt service to public building commission bonds that are solely backed by property taxes. And what about our short-term borrowing? When our rating first dropped to junk last spring, the district’s short-term credit line for capital spending hit penalty rates upwards of 9% interest – forcing the school district to rapidly convert it into long-term bonds, also at penalty rates. How much higher will our short-term credit costs go when the city’s main revenue source is cut off – will the access to cash even be there for the district to keep operating throughout the year? This district’s support of an irresponsible property tax freeze without a concerted plan and effort to bring new progressive revenue to the table is exactly the kind of fiscal recklessness we mean when we say “CPS is broke on purpose”.